If you’re a power mobile user, and you travel a lot, you should know by now that carrying a portable battery pack has become a necessity. Since many devices run out of juice since your mobile device is not only used for calling and messaging, but for several other things such as emails, music, browsing, and what not. If you’re looking for a portable battery pack, you may want to take a look at Reeljuice. Why? It’s not just the usual power bank, it features a 48-inch long, retractable charging cable which can be used to charge an array of devices available in the market. The developers say they have patented the technology, and it’s not just for microUSB devices, it even works with iOS device as well. Along with the regular microUSB cable, the power bank also features a Lightning adapter so you can charge your iPhone or iPad on the go. Furthermore, you don’t have to carry any cord to charge the power bank itself. It comes with a 10 watt rapid wall charger which can be used to charge the device any time, any where. It also features dual USB ports in case you want to charge multiple devices using the power bank, as well as a LED indicator to let the user know about the remaining capacity in the power bank. As an added feature, it also have a flashlight. 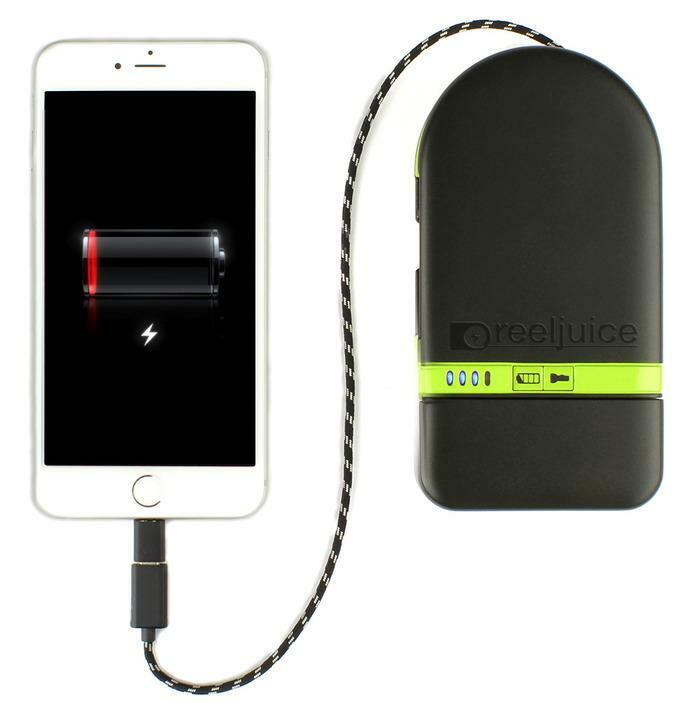 Reeljuice comes in two capacities: 4,800 mAh and 10,400 mAh. The creators have taken the project to Kickstarter to fund the project, and have managed to raise over $30,000 with 29 more days to go. If you think it can be useful, head over to Kickstarter and pledge for it. If they reach the funding, the shipments are expected to dispatch in April next year. In the meantime, take a look at the video below.